This is dependable dual fuel two burner stove. The Coleman 2 Burner Dual Fuel Compact Liquid Fuel Stove can burn Coleman White Fuel or regular unleaded gas. This stove is great for camping, cookouts, tailgating, and outdoors in general. In a Doomsday survival or camping scenario, having a dependable stove in a Bug-In situation would be valuable. Gasoline is something that can be scavenged from your vehicles in a Doomsday survival scenario. Coleman stoves have historically proven to be very dependable over decades. These Coleman fuel version stoves are much more efficient and less costly from a fuel perspective versus propane stoves. The Coleman 2 Burner Dual Fuel Compact Liquid Fuel Stove has one 7,500 BTU burner and one 6,500 BTU burner, and is a relatively small size (17.75-inches by 11.5-inches by 4.875-inches) when closed for easy packing. One 2.5 pint tank gives you two hours of burn time with both burners on high. This stove can boil a quart of water in four minutes. Having a siphon available would also makes it possible to just siphon gas from your vehicle to use in this stove. This stove also comes with the red Coleman Filtering funnel that stops filling fuel at the correct level. 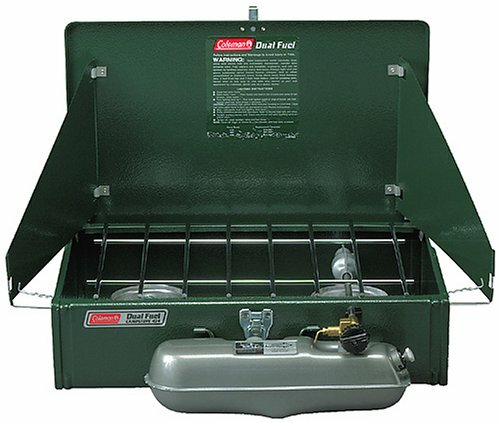 There is a slightly larger slightly more costly model of this Coleman 2 Burner Duel Fuel Stove (with Powerhouse written on the front of the stove). There is a link to it in the recommended accessories below. Added tip if you run unleaded gas through it routinely, it is better if you can find a gas station that carries ethanol free unleaded gas. You can find Ethanol Free Gas using the link below. After going to the site, select your state from the select State icon. Then zoom in or out on the map and click on the "Pins" to see the stations. The following YouTube video is a review & demo of the Coleman 2 Burner Dual Fuel Compact Liquid Fuel Stove. The following YouTube video is a review of the 424 Coleman 2 Burner Dual Fuel Compact Liquid Fuel Stove. "Works perfectly! Even the Arctic Circle!" "Love the dual fuel. Works very well." "This is a great, classic stove. You can use camp fuel or unleaded gas. I bought it for use camping and also for hurricane season. When the power goes out and you've got to cook what was in the fridge, you need something to cook on/with! We've used Coleman stoves for years and the build quality on this one looks similar to our older stoves...."
"If only all things were made this well. Seems to be made of the same trusty stuff as before. The one I have has lasted 45 years and is still going strong...."
"Great Stove. I have had a Coleman dual fuel stove for many years. It has been great for camping, of course, as all coleman stoves are but it was also great during a hurricane. We lost power for two weeks and had all electric. I had no coleman fuel on hand but did have gasoline. We were able to at least keep baby bottles warm and cook our meals every day. Excellent for any automobile camping and very handy as part of your emergency kit." ".....This dual fuel stove is quite the opposite. It is definitely an upgrade on build quality & materials. The box said "Made in USA". It is NOT complicated to operate this stove and there seems little to go wrong with it. The valve allows anything from full bore HIGH to a gentle simmer. The fuel is much less expensive. It also consumes less volume than those green propane canisters and there is much less waste (no empty canisters). The ability to use unleaded gasoline means you have options. Certainly unleaded gas is by far the least expensive fuel option. I recommend using Coleman fuel (white gas) when possible, only because it has no odor and evaporates quickly leaving no residue should a few drops be spilled. Parts are readily available for this stove. With care, it should last decades...."
"The Classic American Camp Stove. If you buy this stove, it is something you'll take on all of your family campouts for decades, and you'll give it to one of your kids one day. This is a piece of classic Americana, but it works better and more reliably than any newer design. Yes, it's slightly old-fashioned, with a manual pump that pressurizes the gas, and a tube in the stove which warms up in order to draw the fuel out, but it adds to the charm and fun, and I've never found it to be any trouble. The directions are printed inside the lid in case you forget. I recommend the little red plastic fill spout accessory that Amazon sells, it makes fillups easy and foolproof....Once this stove is lit, it burns and burns and burns! You'll have no trouble boiling up a pot of water for spaghetti, and the fuel lasts for hours and hours. I really love this little stove and I can't wait to break it out again. By the way, it's not just great for camping, it's also easy to toss into the trunk for picnics and cookouts. Enjoy!"